Troubleshooting? Check out our guide here. There are a few simple steps to integrate PlayPosit with your Canvas course. Below is a video overview of how to use PlayPosit with Canvas. Why use PlayPosit in Canvas? Auto-sync course data: We manage learner-coure relationships, eliminating the need to manually create courses or upload rosters. Auto-sync grades: Learner grades are synced immediately with the Canvas Gradebook at the end of a Bulb. As well, instructors can access the rich analytics from any PlayPosit link within Canvas. Co-instructor collaboration: Multiple instructors, instructional designers and TAs can access their own PlayPosit content and manage any shared course content, like Bulbs and analytics. Course copy: Instructors can save time by seamlessly copying PlayPosit links to recurring courses. The new course and learner roster is automatically synced and previous data is cleared. 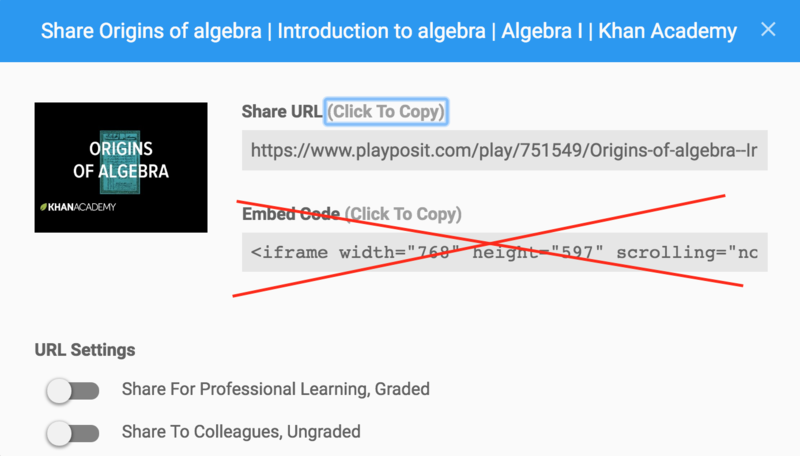 Content Item Message (CIM): Instructors can instantly access and embed their PlayPosit content from the rich text editor of any Assignment, Module or Page. PlayPosit is integrated into your Canvas environment by your administrator. 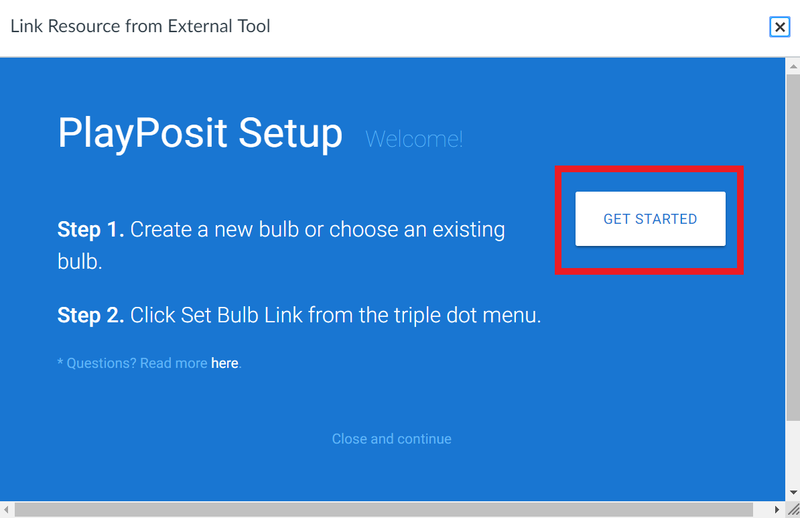 Follow the steps below to add PlayPosit Bulbs to each course and sync your student roster. Login to Canvas and navigate to the course you would like to connect to PlayPosit. Select Assignments from the left column menu and add a new assignment. 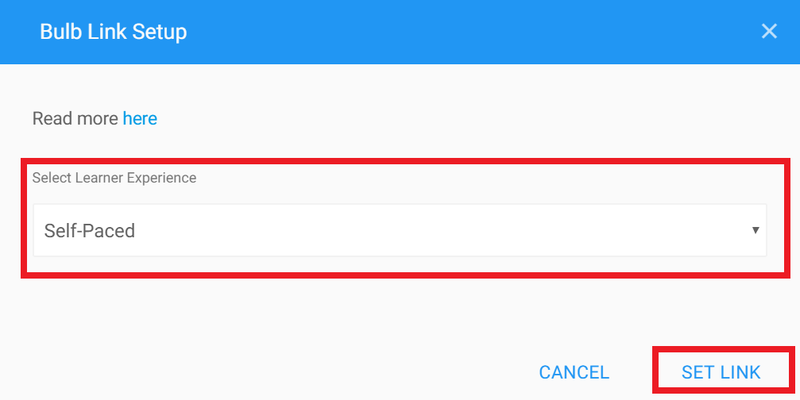 Enter "PlayPosit Setup" in the Assignment Name field. Find and select PlayPosit from the pop-up menu. Note: If you do not see PlayPosit as an option, please contact your admin or instructional designer. Click Get Started to access your PlayPosit account. 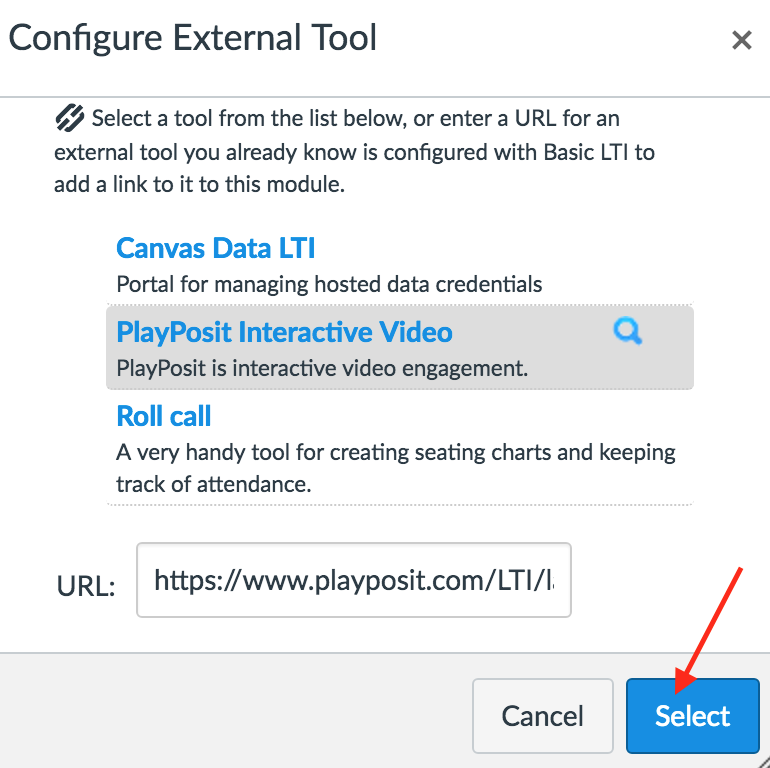 You will now need to link your Canvas and PlayPosit accounts. If your accounts are not linked, you will notice that your account has a generic username. Navigate to Premade Bulbs and click the triple dots > Copy bulb. Go back to My Bulbs and click the triple dots > Set bulb link. When you are redirected to Canvas, click Select on the pop-up menu. 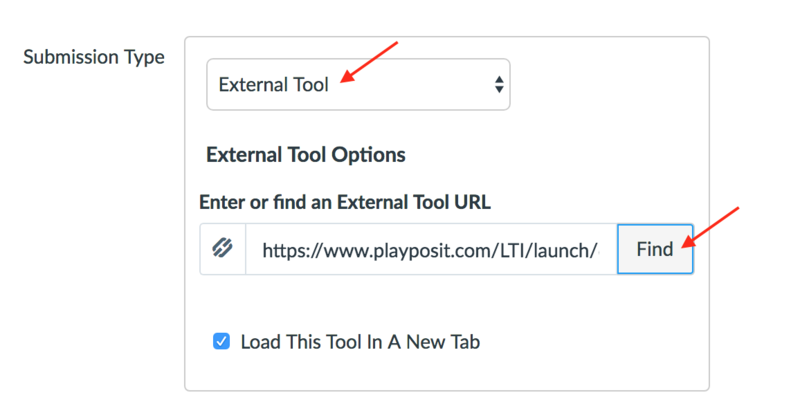 Find the link you just created and then click Close and continue to relaunch PlayPosit. Your accounts are now linked and you will see your name appear on the dashboard. Playposit Bulbs must be linked to Canvas as assignments in order to auto-export grades into the Canvas Gradebook. Grade export is not supported for Modules, Pages, etc., but data will still be collected on the PlayPosit monitor page. In the Assignment Name field, enter the name of your lesson. (Optional, but recommended) Add a Description to provide supplemental instructions to students. (Optional, but recommended) Complete fields for Points, Assignment Group and Display. Find and select PlayPosit from the pop-up menu. Click Get Started to access My Bulbs. 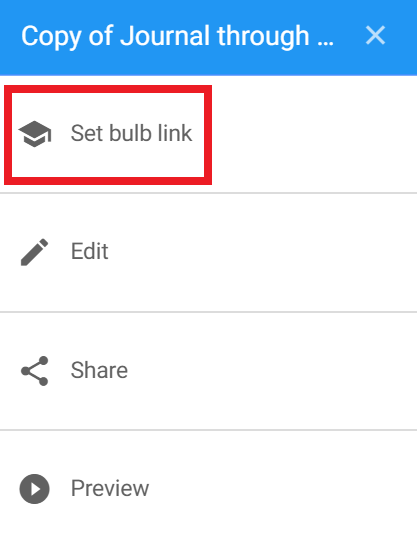 Click the Bulb you want to link, and then click Set Bulb Link. 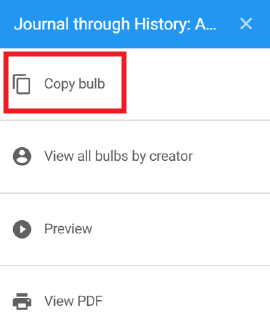 Self-paced - Choose this option if you want learners to take the Bulb individually, on their own device, at their own time (most commonly used). Broadcast - Choose this option if you want to project the Bulb live, in class and have all learners take the Bulb together. Start/stop time and pacing of the video is controlled by the instructor, while learners answer projected questions from their own device (like a clicker). For more information, please view this help article. Set a Due Date and click Save & Publish. If you follow the instructions below for assigning a non-graded Bulb to students, please note that learner grades will not be auto-exported into the Canvas Gradebook. 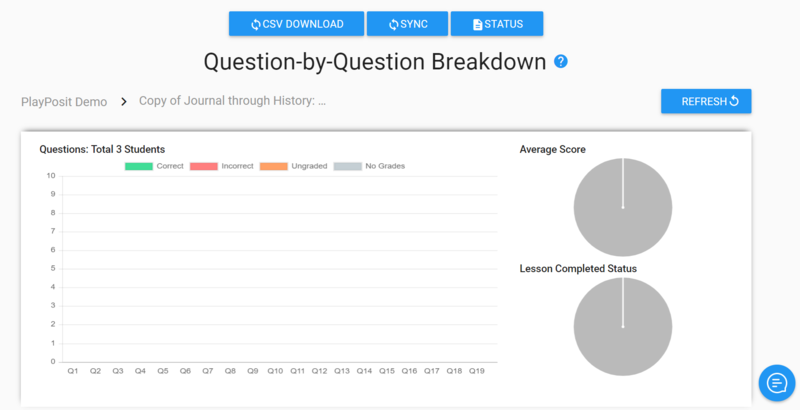 However, data analytics will still be recorded and visible to the instructor on the PlayPosit assignment's Question-by-Question Breakdown dashboard. Create a new Assignment, Module, Page or Discussion. Select the PlayPosit CIM from the rich text editor. Locate the Bulb you want and click Assign. Broadcast - Choose this option if you want to project the Bulb live, in class and have all learners take the Bulb together. Start/stop time and pacing of the video is controlled by the instructor, while learners answer projected questions from their own device (like a clicker). For more information, please view either this help article (with LMS support) or this help article (without LMS support). Select Placement and click Confirm. Make sure Submission Type is set to No Submission. In Canvas, click on the assignment for which you want to view data. This will open PlayPosit Setup, which will show the PlayPosit Bulbs you have linked to this assignment. Click Monitor to view student participation and responses. For more information on PlayPosit Analytics, please view this help article. If your Bulb only includes auto-graded questions (multiple choice, check-all-that-apply, fill-in-the-blank), then grades will be automatically exported into the Canvas Gradebook. For more information on automated grading, please view this help article. Click on the Assignments tab of your navigation bar, and then click on the assignment for which you want to view student response data. 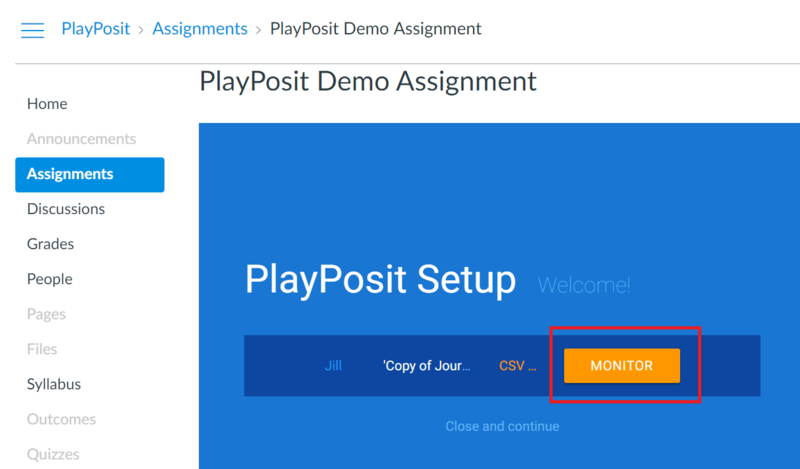 On the embedded PlayPosit page, click Monitor to navigate to the assignment's Question-by-Question Breakdown dashboard. Click Sync to initiate the process of exporting student grades to your Canvas Gradebook. You can also click Status to check the status of the student grade export, but please note that it may take a few minutes to push all updated scores to the Canvas Gradebook. PlayPosit/Canvas LTI integration does not support embedding Bulbs using an embed code. Grades will not auto-sync from PlayPosit to Canvas.